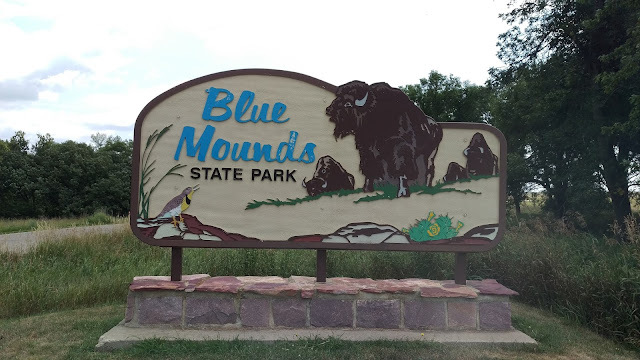 I've always wanted to visit Blue Mound State Park, but never got around to it until now. The park is located in the extreme southwest corner of MN, just a few miles in from South Dakota, north of Luverne, MN off I-90. 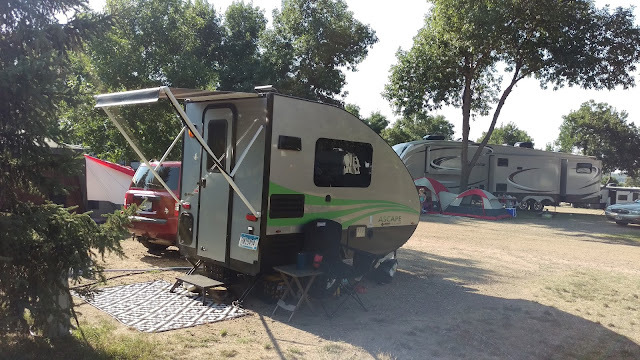 We had a family gathering for "Christmas in July" in Sioux Falls, SD, and instead of just a Friday to Sunday trip, with a 4 hour drive there, then 4 hours home, it was the perfect time to finally visit. And I was not disappointed one little bit! Even the water situation didn't bother us (more on that later). Got there on Sunday afternoon, just a short drive from Jellystone we were at (had to stop at Caribou Coffee first in Sioux Falls). This is a very typical state park for MN, not having a big tourist attraction, it's busy on weekends, and wide open during the week. People were packing up and heading out as we pulled in. The main campground has 73 sites, and from Sunday until Wednesday (when we left), I think at most, there were 8 sites being used. Most of the people that came in were overnighters, and packed up the next morning heading off to where ever they were going. 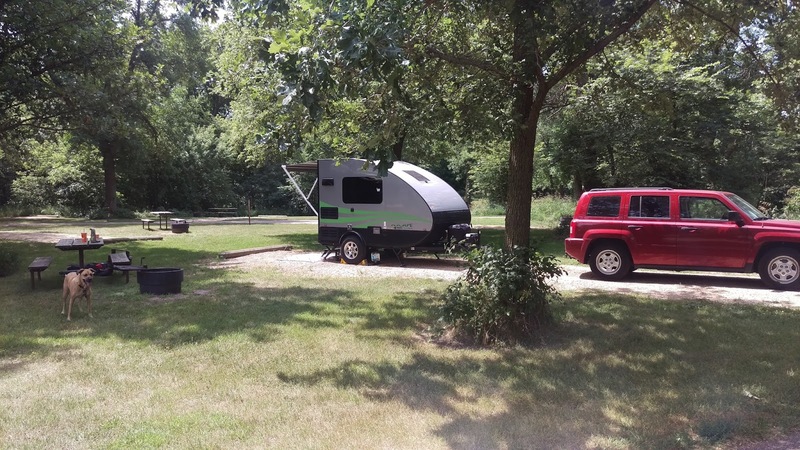 The campground is wide open, with a few trees placed around so there was some shade. had to go chase it a few times during the day, but we always had shade at our site. This was good since it was on the warm side (in the mid to upper 80's), and very little breeze. 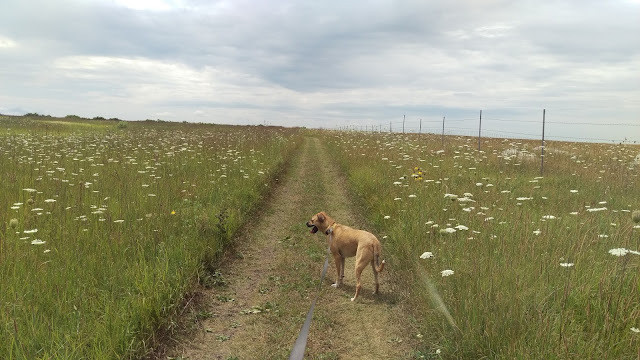 While here, I made sure that we headed out on the trails. They do have a small bison herd there at the park (the fence in the picture above is part of the bison area). They don't roam around the park freely, but there is a large area they are kept in. The area was also once the bottom of a sea, and sand deposits fell on the sea floor. Over time, they compressed to form sandstone, and heat and a chemical process, that sandstone became quartzite that is seen throughout the park. Most of the state parks in Minnesota are either forested areas, or along lakes/rivers (or both). 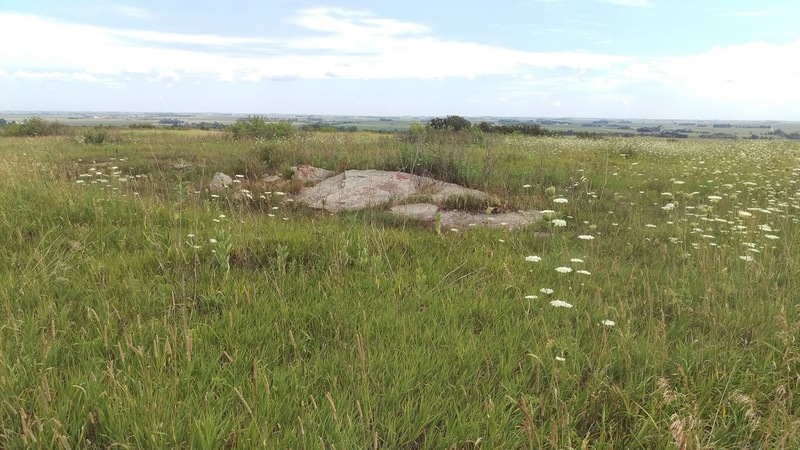 What has always appealed to me about Blue Mound was that it's a prairie. Something really different from all the other state parks I've visited. 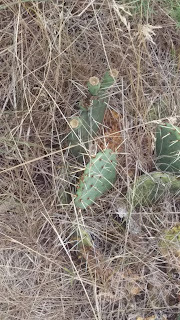 One of the things that really caught me off guard was the prickly pear cactus that grows in the park. 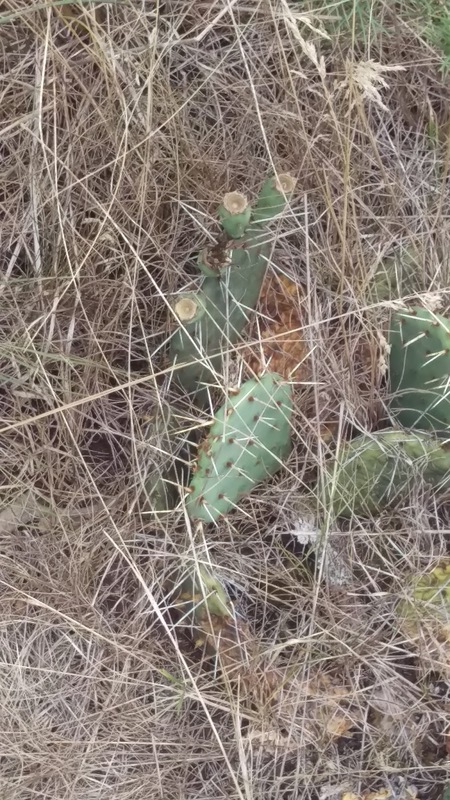 I've never known that there was any cactus (or is it cacti?) that grows native in Minnesota. But doing a little research, it is the most cold-tolerate species of cacti, and while native to North America, it's range goes from Mexico all the way up to Canada. 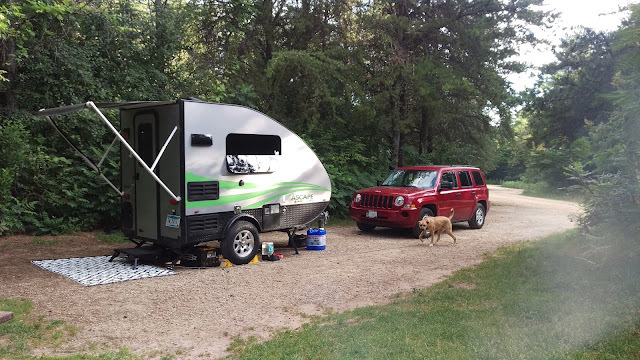 Our last night at the campgound, a retired couple from Milwaukee pulled in. They were just staying over night, on their way to Mt. Rushmore. Just making small chat, I mentioned that I used to go to Milwaukee quite a bit when I was stationed in Great Lakes, IL for training (it's a Naval Training Center, where Boot Camp and many of the schools are located). Turns out that he was a Boiler Tech in the Navy in the early/mid 60's! We sat around for a little while drinking brandy and beer, reminiscing about each of days in "Uncle Sam's Canoe Club' until his daughter and her husband and kids showed up. As I mentioned earlier, there is a situation with the water in the park. Their well has tested positive for E coli contamination, so all fresh water has been turned off at the park. The only use of the water is for flushing in the toilets and the non-potable water at the dump station. They do, however, have a couple places before you get to the park that you can stop and fill up your fresh water tank, and they do provide gallons jugs of fresh water for free at the office. 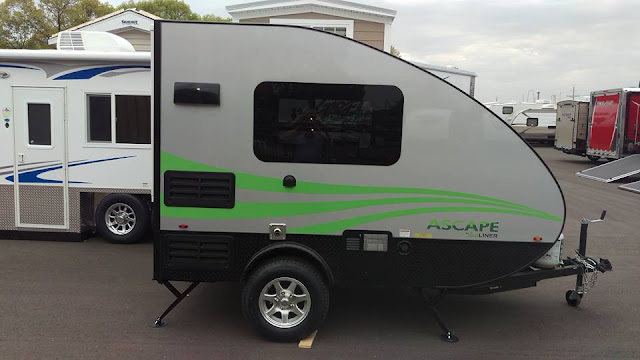 And if you do need to use shower facilities, the Aquatic and Fitness Center in Luverne have showers available to campers at no charge. When I made reservation s a couple months ago, I asked about the water. The response I got was that they are waiting for a bonding bill from the legislature to pipe in water from town. I didn't see anything that looked like any work was being done yet, so I would not expect the situation to be resolved by next year. As I stated, though, it's not a disappointment at all. There are alternatives sources of water and shower, so it's not a loss one bit.